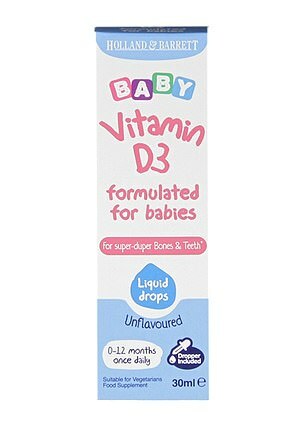 Only a quarter of multivitamins aimed at children contain the recommended level of vitamin D, according to research. Health officials recommend anyone over the age of one receive a daily 10 microgram (400IU) vitamin D supplement. While infants aged under one should be given a 8.5 to 10 microgram (340-400IU) daily vitamin D supplement to ensure they get enough. But a study, branded ‘highly concerning’, has now found the multivitamin market is flooded with products that fail to hit the recommended dose. Vitamins produced by Bassetts, Haliborange, Holland and Barrett, and Vitabiotics were among those who had products below the guidelines. 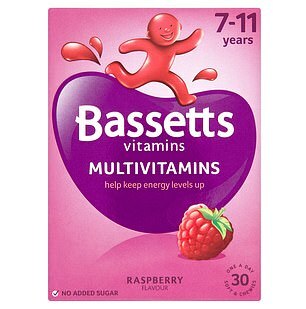 A team of academics based at the universities of Oxford and Southampton analysed dozens of vitamins aimed at children. They were sold by Asda, Morrisons, Ocado, Sainsbury’s, Tesco, Boots, Holland and Barrett, Lloyds Pharmacy and Superdrug. Vitamin D is essential to prevent rickets, a condition that affects bone development in children and which can lead to the growth of soft, weak and deformed limbs. It is difficult to get enough vitamin D from diet, and the main source is sunshine. But the weather in the UK means there is limited sunlight from November to March. 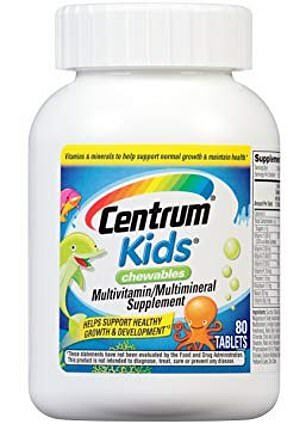 In total, 67 multivitamin products made by 24 different manufacturers were included in the study, published in the Archives of Disease in Childhood. Only one multivitamin was suitable for use from birth – by Abidec – and this supplied 200IU per day – around half the recommended amount. For children under six months, only one multivit contained more than 340 IU/day vitamin D, but this was only recommended from four months of age. For children over six months, between 25 and 36 per cent of the available products provided the recommended 400IU per day. HOW COMMON ARE VITAMIN D DEFICIENCIES? The number of people being hospitalised for the ‘Victorian’ diseases scurvy, rickets and gout has risen by a quarter in a single year, it was revealed today. NHS figures show the old-fashioned illnesses, and vitamin D deficiencies, are on the rise and sending children as young as nine to hospital wards. Vitamin D deficiency is the biggest problem of the four, the data showed, with the bone-weakening condition shooting up by 34 per cent in a year. There were a total of 267,511 hospital admissions in 2017/18 for those four conditions – a rise of 26 per cent on 212,239 the year before. More than a third of all those patients had a vitamin D deficiency as either their main diagnosis or something which was noticed afterwards. The team of researchers, led by Dr Nicholas Harvey, also looked at specific vitamin D products and vitamins marketed as being for healthy bones. Of the 24 products that were available, the range of vitamin D in them ranged from between 50 to 1,000IU. Six products were suitable from birth, of which five contained 340 to 400IU per day – around the recommended amount. Nearly two thirds of the vitamin D specific products contained at least 400 IU/day, found Dr Harvey and colleagues. The authors wrote: ‘There is a wide range of both multivitamins and vitamin D supplements available for children in the UK, yet most of these do not provide the recommended 400 IU/day. The team also looked at the Government’s Healthy Start scheme, which provides free multivitamins to low-income families, but these provide only 300IU per day of vitamin D.
Dr Benjamin Jacobs, from the Royal College of Paediatrics and Child Health (RCPCH), said: ‘A normal healthy UK diet provides less than 10 per cent of the recommended amount of vitamin D.
‘The natural way to obtain vitamin D is from sunlight, but there is inadequate exposure to sunlight in the UK so supplements are the only way to ensure UK children get the recommended dose. 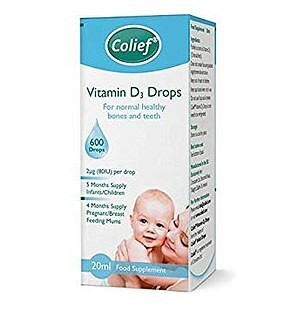 ‘To learn that so many products fail to provide children with the recommended level of Vitamin D is highly concerning, especially when latest evidence shows our children’s average intake are still below the recommended amount. ‘These products are misleading parents who think they are protecting their children from serious conditions such as rickets, poor growth and muscle weakness. He also said the Government should seriously consider fortifying some foods and milk with vitamin D.
Dr Carrie Ruxton, from the industry-funded health and food supplements information service (HSIS), said: ‘Food supplements are meant to supplement the diet, not replace the nutrients obtained from foods. ‘In that respect, and since there are varying recommendations across different age groups of children, it is right that different supplements offer different doses. ‘Smaller doses allow parents to use the same product for younger and older children by varying the amount given. ‘According to the most recent National Diet and Nutrition Survey data, children and adolescents are only getting a fifth of the recommended vitamin D intake of 10 microgram from food alone. WHAT WERE THE PRODUCTS THAT WERE STUDIED?